Added on 07/11/2018 keane aristodemos , 'O sarracino! The Aristodemos – O sarracino! 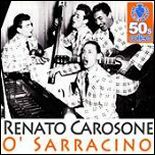 O Sarracino, Renato Carosone – A great song and still greater performance by Renato Carosone and Gegè Di Giacomo. Written in 1958 by Carosone and Nisa, the “Sarracino” – etymologically “Saracen” is a nickname for a handsome, dark-haired guy, a rogue every woman dreams of, with curly hair and a suntanned face. At first Carosone wanted this figure to be an oriental character, but Nicola Salerno (Nisa) convinced him to make the Sarracino e Neapolitan character. ‘O Sarracino appeared as a 45rpm recorded by the sextet Renato Carosone (vocal, piano) Gegè Di Giacomo (drums, percussion, voice), Piero Giorgetti (bass, voice), Raf Montrasio (guitar), Riccardo Rauchi (percussion), Gianni Tozzi Rambaldi (saxophone), Tonino Grottola (clarinet) and a special appearance of Aldo Pagani (percussion). all women he makes fall in love! si ‘o vede ‘e passà. he makes you fall in love. e ‘na bruna se ne more. chisto ‘e femmene che ll’ fa? si ‘o guardate ve fa’ nnammurà. and a brunette dies for him. Is it poison or a magnet? what does this guy make to women? t’ha arrubbato anema e core! Sarracino, nun si cchiù tu! stole your soul and heart! Sarracino, you are not yourself any more!